Barack Obama’s books have been on my “to read” list for a while but I kept putting them off because of my oft-mentioned difficulties with reading non-fiction. I also have difficulty with audiobooks, so what possessed me to try Dreams From My Father on audio I will never know. I suspect it’s an interesting book. 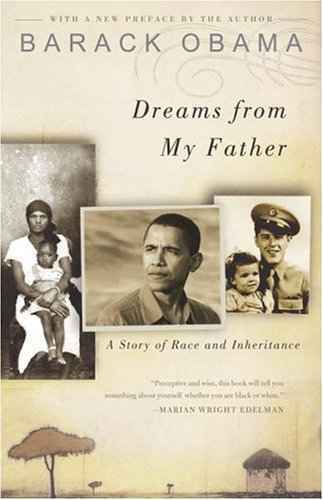 In fact, I really enjoyed the parts I paid attention to, such as Obama’s childhood in Indonesia and Hawaii. I think my favorite part was when, as a schoolboy in Hawaii, he bragged about his Kenyan father, exaggerating his position, claiming that he was practically a chief of his tribe and that once his father was gone he, too, could be a chief. And that is practically like being a king! But maybe he would decline being chief. He hadn’t decided yet. Soon after making these claims, Obama learned that his father was coming to visit and would be coming to school to give a talk to his class! Yikes! In another interesting passage, the young Obama picks up an issue of Life magazine and finds a picture of a black person who has undergone treatments to make himself appear white. The photo, and the idea of someone being so unhappy with their race, haunted Obama for years to come. Obama also tells (and by the way, the audiobook is read by the author) about his years as a community organizer, and his trip to Kenya to visit his father’s family before he begins law school. This visit sounds enjoyable in some ways and disorienting in others, such as learning that nobody knows for sure who he is actually related to since Dr. Obama was known to have had affairs with married women and claim that various children were his when in fact they may not have been. I know I missed a lot because of the audio format, and much to my chagrin I learned partway through that the recording I was listening to was abridged. Consequently, I don’t feel qualified to review it, but I have committed to posting about every book I read. Just take this all with a grain of salt. Politics aside, if you are interested in memoirs of people from interesting backgrounds, including journeys to foreign countries and discussions about race and family, I would recommend this book. The writing is good, the author has an interesting story to tell and, hell, he’s the President. He is worth learning about just for that reason.